Fresno State President Joseph I. Castro will be the keynote speaker at the Central California Hispanic Chamber of Commerce monthly Amigo Luncheon at 11:30 a.m., Thursday, Sept. 21, at Piccadilly Hotel (2305 W. Shaw Ave.). The event, cosponsored by ReZCom, is part of the chamber’s observance of Hispanic Heritage Month. Castro will speak about the state of education and how Central Valley’s business community can benefit from Fresno State producing qualified business professionals. 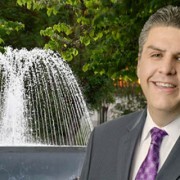 Castro, who was appointed as the eighth president of Fresno State in 2013, is the first Central Valley native to serve in this leadership position. The grandson of farmworkers from Mexico, he was born and raised in Hanford and is the first person in his family to graduate from a university. Luncheon tickets are $15 for members, $20 for non-members, and available online athttps://cchcc.biz/events/#!event/2017/9/21/september-2017-amigo-luncheon. INFO: 559.549.4480.